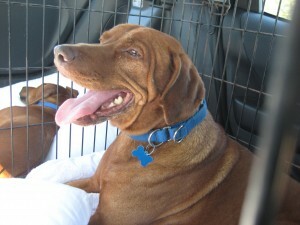 We got both Jake and Lindy through the Rhodesian Ridgeback Rescue. For a long time now, I’ve wanted to get more involved with this organization – after all, two of our family members came to us because other people volunteered their time and lives. A couple of weeks ago, we heard about two dogs who were purchased at an auction. They were puppy mill dogs – dogs that came from a place where they were caged, mated, and bred to sell. One, Mac, an adult male, had been so neglected that he was covered in ticks. Thousands of ticks. The organization picked him and a puppy, Buck, up in Missouri. They medicated Mac, who was so miserable that he wasn’t active and wouldn’t eat. RRR got foster homes set up in New England, but needed to get the dogs there. A bunch of folks started planning the transport, and asked for volunteers to take legs and keep the dogs overnight as needed. They coordinated a crazy caravan of folks. 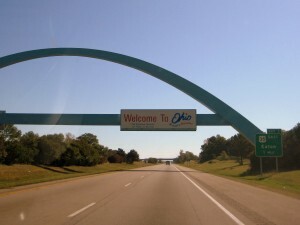 David and I just drove a short piece of the trip – Indianapolis to Columbus – but it was a neat experience. For one, we got to meet some of the folks we’ve been talking to over the past couple of years. There’s another woman in Indianapolis whose home is a foster home for local rescue dogs – we met her and her husband (they kept the dogs overnight before we took them). We also met Carol, a wonderful woman who lives in Ohio – she’s the one who arranged both of our adoptions. We left Mac and Buck with her. She was a delight to meet, and just the kind of person you’d think would open her home to hopeless dogs. I hope they get a good home!